This Incredible Package Gives You an Insider’s Look on How to SLASH our Negative Gearing Losses and Make Positive Cashflow With Vendor Finance...And it’s FREE! The three simple steps to launch your new exciting journey in vendor finance. We all know time is money…so the faster you can wave goodbye to mainstream real estate investing and start wrapping houses the better. These steps will have you on the right path in just days! The secret low cost marketing strategies that make your phone run red hot with people desperate for your property. These simple methods have allowed me to bank more than $300k part time the last 10 years alone...and the best part is you don’t have to be a marketing genius for any of them! The Aussie Wrapper’s ‘10 Golden Rules to Wrapping a Property’. When you follow these simple rules you dramatically limit your risks and increase your profits on each deal. Ignore them at your own peril! And far too much to mention here in some mere bullets. You’ll be left thinking to yourself…The Aussie Wrapper has gone MAD for giving this away FREE! It IS possible to generate income from your real estate investments! And I’m not talking about ‘diamonds in the rough’ that produce more rent then your mortgage payments. A way where YOU can receive payments week after week for hundreds of dollars. At the end of the year you get a HUGE lump sum payout, sometimes more than $20,000.00 - $30,000.00! I’m talking about Vendor Finance – a little known and often overlooked strategy within Australia. Most of the world’s best property investors – like Robert Kiyosaki and Donald Trump – all use it to make massive profits. Everyday investors like you and me can use this powerful strategy just as easily. It’s been my real estate strategy for the past 10 or so years, after two decades of toiling with ‘buy and hold’ strategies and negative gearing. I’ve used it to generate $307,467.56 part time, stress free, WITHOUT forking out losses to the bank every week. Now real estate investing is a passion-hobby for me so I’ve only done this part time. But if you have a decent amount of capital and you want to make real estate investing your full-time gig, you could make much more than I have. It can make you incredibly wealthy, and the best part is, you start making cashflow right from the start! Generates rivers of revenue through positive cashflow in real estate. We all dream of multiple income streams, but you can now make it your reality! It’s one of the main reasons I put together this Ultimate FREE Gift Pack in the first place – so you can get an understanding of the fundamentals of wrapping a home for profit. The other reason I put it together, and made it FREE is so you can get to know me and understand how I can help you make more money with your real estate investments. I realise the internet is full of scam-artists and wannabes. So by making it FREE you have a risk-free way of getting some great info and getting to know me. Once you’ve been through my Ultimate FREE Gift Pack and seen how profitable vendor finance can be for you I’m sure you’ll want more help. And there’s plenty of ways I can help you begin using vendor finance to produce positive cashflow. I suppose by now you want to know what’s included in your Ultimate FREE Gift Pack. 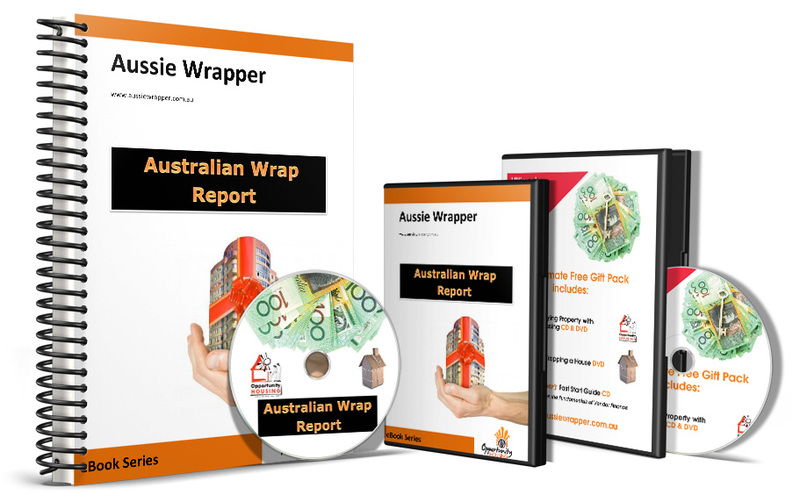 A quick look at one of the many methods The Aussie Wrapper uses to generate dozens of leads for his properties. This recording shows you one of the most effective ways of building a hot list of potential clients BEFORE you’ve even put any money into a house! That’s SIX DISCS and a spiral bound report crammed with information on how you can get started making weekly profits with vendor finance. All I ask is that you cover the cost of postage and handling – just $14.95. That way I won’t send myself broke when savvy Aussie investors, just like you, all beat my door down to get their copy. Click the button below now to begin your exciting new journey to financial freedom. After you okay the transaction, your Ultimate FREE Gift Pack will be rushed to your letter box in 3-5 business days. Then you can tear open your package and feast on the money making information within. The balls in your court now. Will you invest a measly $14.95 to take the next step in your investing career? To finally say goodbye to the daily grind and weekly negative gearing losses? I look forward to hearing how you get on with your Ultimate FREE Gift Pack.